November, 2017 | Upper Peninsula of Michigan Radio - Yooper News, Interviews, Pictures, and Calendar of Events - Great Lakes Radio, Inc.
Ishpeming – A dance to celebrate “Pikkujoulo” or “Little Christmas” will be held on Sunday, December 3 from 2 to 5 p.m. at the Ishpeming Elks Club. Music for dancing and listening will be offered by Wil Kilpela on accordion and Ken Holster on banjo and guitar. Tanja Stanaway and her Heart of Finland Traveling Tori will be staffing a mini-market. Janet Wisuri will offer a variety of baked goods. Refreshments of cardamom coffee bread and other goodies will be available, along with coffee and soft drinks. The Elk’s bar will be open. There will also be a 50/50 drawing and door prizes. Tickets are $5 at the door. The event is free for members of the League of Finnish-American Societies UP Chapter Finlandia Foundation Affiliate. For more information, call 226-7085. Gwinn – A Breakfast Buffet will be offered on Sunday, December 3 from 9 a.m. to noon at VFW Post 5670 in Gwinn. The cost is $8 for adults and $5 for kids under 10. Breakfast includes pancakes, french toast, scrambled eggs, potatoes, biscuits and gravy, bacon and sausage. Marquette – “Walk in Someone Else’s Genes” will be held on Sunday, December 3 from 5 to 9 p.m. at the Upper Peninsula Children’s Museum, 123 W. Baraga Avenue in Marquette. Bring your child or toddler for a night of fun and learning about embracing others. This event is for those of all abilities. Expert-led sensory play stations will be featured in addition to the usual wonders of the museum. There will be a low-stimulation area for those that need. Disability advocates and educators will be in attendance presenting a great opportunity for children to learn and ask questions about others with special needs in a safe environment. Live music will be playing throughout the evening. Food trucks will be parked outside for hungry tummies. Bring some cash for the raffle/auction which will feature a number of enticing baskets for kids and parents that you won’t want to miss. This is a fundraiser for Sadie and KIF1A. KIF1A related disorder causes a number of symptoms including vision impairment/blindness, seizures, muscle weakness or spasticity, developmental delays, and death. We are racing to find a cure for Sadie and others with this disease. Please visit kif1a.org for more information about our efforts. Hancock – Sons of Norway will celebrate Julefest with a potluck dinner on Sunday, December 3 at beginning with set-up and a social time at 4:30 with dinner at 5 p.m. at Gloria Dei Lutheran Church in Hancock. All members and those interested in Norway are welcome are welcome for the potluck, a program on a Julenisse at 7 p.m. Please bring a dish to pass and any Julenisse pictures, books, stories or figurines to share if you have them. Marquette, MI – The Marquette Regional History Center presents: 2nd Offering! 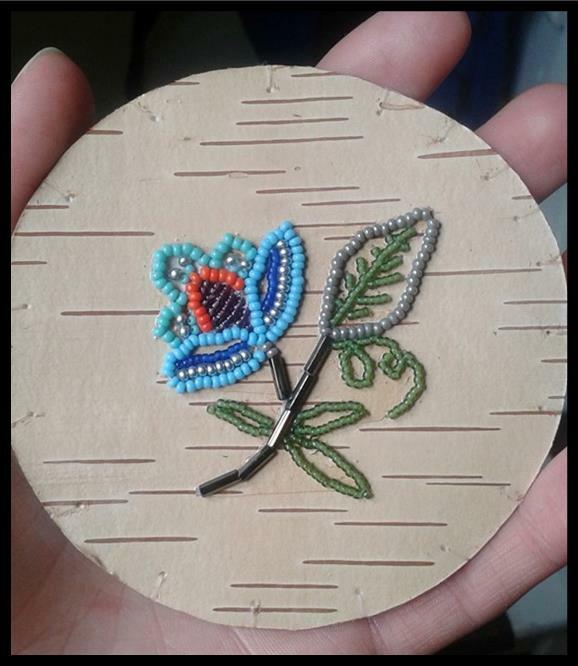 Native American Quill and Beadwork Discussion and Workshop Saturday December 2, 1:00-3:00 p.m. Learn about the history of these traditional crafts from NMU Instructor Leora Lancaster and then try your hand at practicing some of the techniques. Materials included in the workshop fee. Limited to 20 people, advance sign up only. Workshop fee $25.00, non-refundable. Sign up starting now. Please visit marquettehistory.org for details on this “one of a kind” event. Or call 906.226.3571 for more info. Marquette – The Marquette Regional History Center will hold a Membership Drive on Saturday, December 2 from 8:30 a.m.to 2:30 p.m. at Super One Foods in Marquette. The History Center will be participating in a membership drive, offering 10% off all memberships, and new members will receive a hard cover copy of “Harvesting the Wilderness” by John Parlin. Come see the newly renovated Super One store for a cookie, while supplies last, and learn more about the Marquette Regional History Center. For more information, go to marquettehistory.org or call 906-226-3571. Ishpeming – A used book sale will be held on Saturday, December 2 from 10 a.m. to 4 p.m. in the Leverton Community Room of the Carnegie Library in Ishpeming. Hardcovers will sell at $1, while paperbacks will be priced at 50 cents. There will be a half-price sale from noon until 2 p.m. and from 2 to 4 p.m. used books will sell for three dollars a bag. The Friends of the Library have for sale new notecards of local landmarks, a Winter Sports Clubhouse ornament, and new recipe books, as well as 2018 calendars. Holiday refreshments will be served! Escanaba – “Party With A Purpose” 67th Annual Charity Ball will be held on Saturday, December 2 beginning at 5:30 p.m. at the Terrace Bay Hotel in Escanaba. “Party With a Purpose” is a dinner, dance party that raises funds for the needs of area children, student academic programs, food banks, and many community needs. Tickets are $55 and available at Lisa Annes, The Morrison Shop, Gust Asp, Positively and Trotter’s Floral. For more information, call Kay Johnson at 906-235-2027.